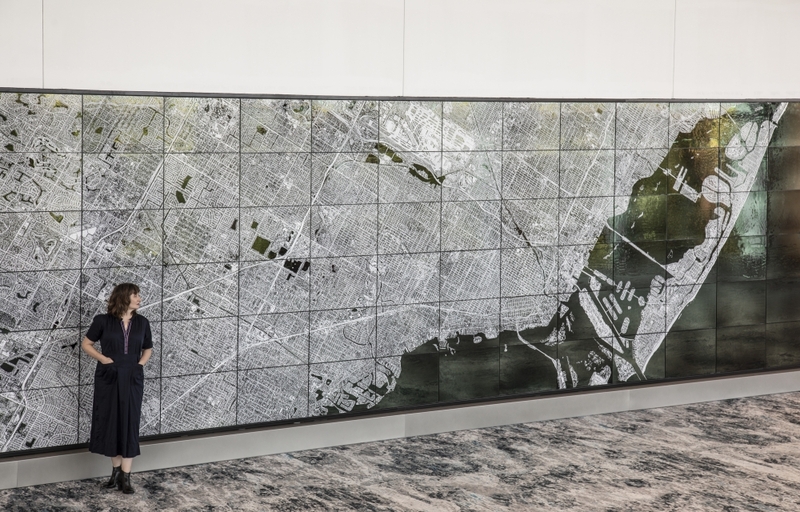 Visitors to the Miami Beach Convention Center will see themselves reflected in a dark shimmering 10 ft. x 100 ft. mouth-blown glass mirror engraved with a white painting of a diagonal satellite view of Florida reaching from the Gulf of Mexico through the great watershed of the Everglades to Miami Beach and the Atlantic Ocean. As the light changes throughout the day, the image appears to float above and then be subsumed by the reflections, literally mirroring Florida’s intimate relationship to its water table. The mirror is divided into two sections so that visitors enter the new Grand Ballroom at the intersection between the man-made and the natural landscape -- at the border between the Everglades National Park and the outskirts of Miami. Atlantis allows visitors to situate themselves within the larger landscape, providing a poignant and thought-provoking overview of the natural beauties that make Miami Beach such a seductive destination.